Park or Bird? is a web app by the Flickr Vision and Search team that can determine whether a photo depicts a bird or a National Park. 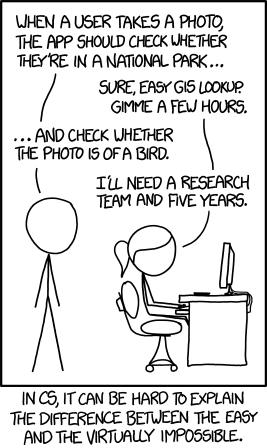 The app stems from an xkcd comic about the often confusing difference between a simple computer task (determining whether a photo was shot in a National Park) and an extremely challenging task (determining whether a photo contains a bird). After seeing the comic, Flickr engineers built the Park or Bird? app using existing technology. National Park photos can indeed be identified easily through a photograph’s location data. Birds, on the other hand, require complex computer vision algorithms and something called a “deep convolutional neural network”, which can be read about in a Flickr blog post.